Carib Cruises Blog - What's New? What's New at Carib Cruises? As you can see this page is pretty self-explanatory...your guide to what's new here. A vacation can be considered an idyllic period of time for creating that kind of life you wish you had pretty much every day, if only for one single week. Continue reading "Tips on How to Take a Lesbian Cruise"
Discover the four best Aruba beaches. Learn which beach to choose for watersports, snorkeling or some peace and quiet. Continue reading "Aruba Beaches, Vacation in Aruba"
Get the most out of your Aruba car rental with these tips from a long-term cruiser. Nothing beats first hand experience. Continue reading "Aruba Car Rental, Aruba Jeep Rental"
Join us for a round of Aruba snorkeling at Boca Catalina beach - great for beginners and experienced snorkelers alike. Continue reading "Aruba Snorkeling, Things to do in Aruba"
Zap around this cool interactive map of Aruba.Then zoom into the detailed views of its beaches, downtown Oranjestad and the rugged East coast. Continue reading "Map of Aruba Beaches and Downtown"
Know the things to do in Aruba before you go! Learn about Aruba snorkeling, tours and how to best get around the island. Continue reading "Things to do in Aruba"
Save on your Disney vacation packages by adding a 3 day cruise. Extra fun for the whole family guaranteed. Continue reading "Turn Disney Vacation Packages Into More Fun For Less Money"
Sidestep overpriced Disney Cruises with our recommendations for the best family cruise. Continue reading "Best Family Cruise Recommendations"
Organize the perfect family reunion - top 10 reasons why a cruise is one of the best and cheapest family reunion ideas. Continue reading "Family Reunion Ideas, Cheap Family Vacations"
Transform your cheap family vacations into a Caribbean cruise adventure. 7 reasons why cruises are fun for kids, teens and adults, at a reasonable cost. Continue reading "Cheap Family Vacations, Family Vacation Ideas"
Beautiful Klein Bonaire pictures - browse our gallery. Continue reading "Klein Bonaire Pictures"
Continue reading "Jerk Chicken Anyone?" Continue reading "Christmas in Aruba"
Continue reading "Family reunion on Disney's Dream"
Continue reading "Honeymoon on the Conquest"
Princess of the Seas Cruise"
Continue reading "Honeymoon Trip Disney Wonder"
Read the top Caribbean cruises news, hot off the press - or submit your own news story. Continue reading "Caribbean Cruises - Hot News Selected For You"
Beautiful gallery of cruise ship photos. Get insider views of the Emerald Princess, Carnival Miracle and others. Continue reading "Cruise Ship Photos"
Check out our gallery of beautiful St Thomas island photos. Continue reading "St Thomas Island Photos"
Continue reading "Caribbean Sunsets - Photos"
Browse through our unique collection of Caribbean island photos and photos of cruise ships. Continue reading "Caribbean Island Photos"
See our collection of beautiful Dominica island photos. Continue reading "Dominica Island Photos"
Beautiful gallery of Carnival Miracle photos. Continue reading "Carnival Miracle Photos"
Beautiful photo gallery of the Maasdam cruise ship. Beautiful gallery of Caribbean Princess photos. Continue reading "Caribbean Princess Photos"
Beautiful gallery of Emerald Princess photos. Continue reading "Emerald Princess Photos"
Enjoy a Princess Cruise Bahamas style, or one of the numerous 3 night Bahamas Cruises. Continue reading "Princess Cruise Bahamas & Princess Cays"
Princess Hawaii Cruises take you to many Hawaiian jewels. Learn about Kona, Maui and other poplular ports. Continue reading "Princess Hawaii Cruises, Maui Princess Dinner Cruise"
Enjoy a Princess Cruise to Panama Canal, one of the many bargain panama canal cruises. Continue reading "Princess Cruise To Panama Canal"
With our tips for Princess Cruise Lines discounts, you are all set to enjoy a cheap Caribbean cruise holiday. Continue reading "Princess Cruise Lines Discounts & Cheap Princess Cruises"
Our Princess Cruise Line reviews help you travel smart. Read them before you book your Princess Hawaii Cruises or any other cruise vacation. Continue reading "Princess Cruise Line Reviews & Princess Cruise Lines Discounts"
Upgrade your next vacation with these great vacation ideas, hand-selected and quality-approved by Carib-Cruises. Continue reading "Great Vacation Ideas and Travel Destinations"
The Princess cruise lines have a special treat for their passengers: Princess Cays, a resort exclusive to Princess cruises itineraries. Continue reading "The Princess Cruise Lines - Get Pampered On Princess Cays"
Royal Caribbean Europe cruises are your best option if you want to see places like Paris, Rome and Madrid in a relaxed, affordable way. Continue reading "Royal Caribbean Europe Cruises - A Great Way to Explore Europe"
Don't miss our Royal Caribbean Cruise review if you consider using the RCCL cruise line for your next Eastern Caribbean cruise. Continue reading "Royal Caribbean Cruise Review, Eastern Caribbean Cruises"
Make the most of your Royal Caribbean Cruises shore excursions. Read our tips about the popular Dominica tours, snorkeling in the Caribbean and other gems. Continue reading "Royal Caribbean Cruises Shore Excursions, Best Caribbean Beaches"
Of all of the Royal Caribbean Cruise ships, the Adventure of the Seas provides a fun filled experience for the whole family. Continue reading "Royal Caribbean Cruise Ships, Adventure of the Seas Reviews"
Must-know tips for discount Royal Caribbean Cruises and how to get the best Caribbean cruise deals. 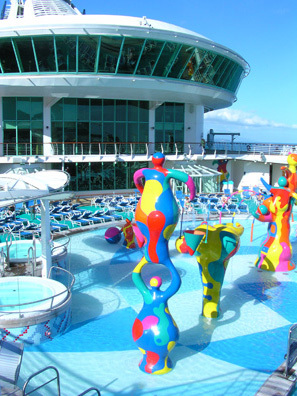 Continue reading "Discount Royal Caribbean Cruises, Cheap Caribbean Cruise Holiday"
Continue reading "Getting away from it all on Carnival Destiny, February 2008"
Continue reading "20 Cruises in the Caribbean"
Tell us your fondest memories from the best caribbean cruise you ever made. Our readers will love your cruise ship passenger review. Continue reading "YOUR Best Caribbean Cruise - Share Your Story and Your Photos of Cruise Ships"
My most memorable snorkeling in the Caribbean. Continue reading "Snorkeling in the Caribbean"
Continue reading "Caribbean Weather Forecasts, Caribbean Weather, Hurricane Watch"
This is the Carib Cruises SiteMap to help you find your way around the website. Continue reading "Carib Cruises SiteMap"
Discovering Dominica Island with a personal tour guide like Levi is a great experience. Highly recommended! Continue reading "Dominica Island, Titou Gorge, Trafalgar Falls"